Life looks much different from the viewpoint of eternity. T.W. Hunt shows us how different our journey looks from God's perspective. As our tour guide, Hunt reveals the processes God uses to take us where He wants us to be, and how many times we can inadvertently work against God. From Heaven's View illuminates the realities that will enable us to work with God.By focusing on God, His attributes, the Trinity, relationships, and process rather than event, Hunt shows how Heaven is preparing us for glory now, even in this imperfect life. Through triumph or tragedy, seeing the world through God's eyes will bring tranquility, contentment, and understanding. - Publisher From the best-selling author of The Mind of Christ comes a deeply personal story of how three generations of cancer drove his family to their knees---and ultimately brought them face-to-face with Christ's unconditional love. Learn how seeing yourself and your circumstances "through Heaven's eyes" can bring blessing, growth, and even joy on Earth. 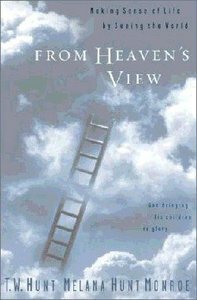 About "From Heaven's View (#04 in Fortunes Of The Black Hills Series)"
From the best-selling author of The Mind of Christ comes a deeply personal story of how three generations of cancer drove his family to their knees---and ultimately brought them face-to-face with Christ's unconditional love. Learn how seeing yourself and your circumstances "through Heaven's eyes" can bring blessing, growth, and even joy on Earth. Bly is Winchester, Idaho's newly elected mayor. He is a writer of Christian Westerns. IN SEARCH OF A NEW LIFE OUT WEST, BRAZOS FORTUNE FINDS HIS FAMILY ENDANGERED BY THE VERY QUEST HE HOPED WOULD SAVE THEM. With these simple words, Brazos Fortune sets out on his journey in the first of Stephen Blys new Fortunes of the Black Hills series. When locals threaten the lives and property of his family. Brazos abandons his Texas homestead for a new ranch in the West he has seen in a dream. Its a war against corrupt lawmen, wild outlaws, and bitter winter weather as Brazos wrestles with his newfound hunger for gold and the burning desire to be reunited with his family. He must test himself against the untamed frontier, confront the greedy miners who try his Christian convictions, and find the new home God showed him Beneath a Dakota Cross. ROBERT FORTUNE IS THE LAST ONE TO COME HOME. Robert is not like his father, the legendary Brazos Fortune. Not a businessman like his brother Todd. Not a notorious retired gunslinger like his brother Sam. Nor the social darlings of the Black Hills like little sister, Dacee June. Hes a career soldier who no longer has a career. With the discipline of a West Point graduate, and the rock solid faith his long-departed mother, Robert moves his family to Deadwood to join the rest of the clan. And in Deadwood, Robert finds not only his placeas a railroad detectivebut a fistful of enemies, all seeking vengeance against him and his family. BRAZOS FORTUNE HAS LEFT A TOWERING LEGACY. HIS SON TODD NOW STRUGGLES TO PROVE HIMSELF AND FIND HIS OWN IDENTITY IN THE SHADOWS OF LEGENDS. Life in the shadows. It happens to all of us. We stand so close to a dominant personality that our reflection can hardly be noticed. Someone more famous. More skilled. More powerful. Sometimes they are people we hardly know. Sometimes they are members of our own family. Brazos Fortune has left a towering legacy. His son Todd now struggles to prove himself and find his own identity in the Shadow of Legends. Todd Fortune must follow his father as he takes over the family business with his wife, a fast-paced city girl whos not willing to settle into a small town lifestyle. A tale of daily hardships and hard-earned victories, Todd struggles to prove himself a committed husband and a courageous frontiersman in the wake of his fathers legacy. Cross-country chases, deadly showdowns, and budding romances weave the story of this second powerful novel in the Fortunes of the Black Hills series.